At one time, tear gas was only deployed on the battlefield, not against civilian protesters. Then Amos Fries came along. Throughout the 1920s Fries began a mission to capitalize on the US military’s enthusiastic development of chemical weapons during the war, turning these wartime technologies into everyday policing tools. As part of this task Fries developed an impressive PR campaign that turned tear gas from a toxic weapon into a “harmless” tool for repressing dissent. The 1920s became a golden age of tear gas. A journalist for the Evening Independent wrote that Fries was often “accused of being an absolute militarist anxious to develop a military caste in the United States.” But to those who shared his cause, Fries was an excellent figurehead. A family man, a dedicated soldier, and a talented engineer, Fries was the perfect face of a more modern warfare. Just as some in Europe argued that chemical weapons were a mark of a civilized society, for General Fries war gases were the ultimate American technology. They were a sign of the troops’ perseverance in World War I and an emblem of industrial modernity, showcasing the intersection of science and war. In an Armistice Day radio speech broadcast in 1924, Fries said, “The extent to which chemistry is used can almost be said today to be a barometer of the civilization of a country.” This was posed as a direct intervention to the international proposal for a ban on chemical weapons: Preparations for the Geneva Convention were well under way. If chemical weapons were banned, Fries knew it would likely mean the end of the CWS — and with it his blossoming postwar career. given much study to the question of the use of gas and smokes in dealing with mobs as well as with savages, and is firmly convinced that as soon as officers of the law and colonial administrators have familiarized themselves with gas as a means of maintaining order and power there will be such a diminution of violent social disorders and savage uprising as to amount to their disappearance. This early promotional writing struck a careful balance between selling pain and promising harmlessness. Its psychological impact set tear gas apart from bullets: It could demoralize and disperse a crowd without live ammunition. Through sensory torture, tear gas could force people to retreat. These features gave it novelty value in a market where only the billy club and bullets had previously been available. Officers could disperse a crowd with “a minimum amount of undesirable publicity.” Instead of traces of blood and bruises, tear gas evaporates from the scene, its damage so much less pronounced on the surface of the skin or in the lens of the camera. Fries’s team had carefully constructed comebacks for such objections. Borrowing loosely from medical statistics, Fries and his team constructed a trio of retorts. War gases, they claimed, killed only one-twelfth the amount of fatalities caused by bullets. Second, only half of disability discharges were from gas. Finally, they argued that there was no medical proof of permanent injury from gas exposure and that serious injuries were very rare. Numbers could be twisted, but veterans’ testimonies stood in their way. Fries and his team claimed these were exaggerated tales, going so far as to publicly declare that “every imposter is beginning to claim gassing as the reason for his wanting War Sick benefits from the government.” This approach provided the groundwork for the decades of legitimizing less lethal weaponry to come. While it would be easy to write Fries off as an anti-communist, racist, and military extremist, the potency of his views arose from his intellect as much as his ignorance. After graduating seventh in his class from West Point in 1898, Fries had entered the academy by acing an exam held by Congressman Binger Herman and went on to impress his superiors and inspire his army subordinates. In the words of his peers, Fries took a situation in which “the entire civilian population,” as well as the army, stood against his pro-gas campaign and ignited in people an “earnest conviction” that these chemicals were the solution to law enforcement and political control in a time of economic depression. Instead of being seen as a form of physiological and psychological torture, tear gas became rhetorically cemented in much of the public imagination as the humanitarian alternative to live ammunition. Into the next century, tear gas would become the most widely used less lethal technology. It would transform into part of today’s $1,630,000,000 global industry in less-lethal weapons, with rapidly expanding markets in Asia, Africa, and the Middle East. But for all that to unfold, Fries and his compatriots would first need to build up a commercial market for tear gas. Beyond trade publications, radio speeches, and news features, Fries and his network also staged large-scale product demonstrations. On a balmy July day in 1921, Fries’s old friend and colleague Stephen J. De La Noy brought large supplies of tear gas to a field near downtown Philadelphia. Here he enacted the power of war gases in peacetime by inviting members of the city’s police department to experience its effects. Inviting reporters to record the spectacle of 200 policemen faced with tear gas, De La Noy set the stage for an enticing media story. This early demonstration spawned a major national and international campaign for the use of tear gases by law enforcement agencies. Throughout the 1920s and 1930s both the CWS and commercial manufacturers peddled their products to police departments, National Guard, prisons, and private security firms. Just as demand needed to be secured, so too did supply. To jump-start the commercial market, Fries donated samples from the CWS to friends — many of them former soldiers — who had become entrepreneurial executives in gas munitions companies. Perhaps the most outspoken of these was Colonel B. C. Goss, who had worked in the chemical warfare division during World War I. A respected chemist and decorated military man, Goss founded the Lake Erie Chemical Company in Cleveland, Ohio. As general manager of one of the largest companies in this new industry, Goss knew profits would follow perception. He wanted to be the single manufacturer supported by the US military, and sought to use his wartime credentials to make this happen. Goss solicited help from his old CWS buddies and learned the art of twisting scientific testing into advertising copy. While the Lake Erie “Blind-X Shells” tests were just one in long series of munitions tests to take place at the Arsenal, the results speak toward common misperceptions about how tear gas is handled. Today when canisters are shot at people’s heads or into rooms or cars, it is seen as an accident or against-protocol use. However, these tests show that tear gas was in fact intentionally designed to be shot at point-blank range at people’s faces and bodies and was indeed recommended for use inside buildings and for ring at close proximities. Second, the test results explicitly stated that the product would be effective against “unarmed individuals.” Again, it was not an anomaly or ethical mistake for police to fire upon unarmed protesters at close range in enclosed spaces. This function was embedded in the very design of these tear-gas weapons. Causing injury to unarmed civilians was an intended outcome of manufacturing these tear-gas shells. In the years since Amos Fries brought military tear gas to the policing of protest, public safety has become ever more dictated by business models for risk and security. Economic interests and the pursuit of private profits fuel these models. Under these conditions, the repression of political communication itself becomes a commodity. It is traded and sold in the weapons advertisements, market reports, and expo galas that tear gas feed the less lethal industry. This industry expands so long as protest stays criminal and the police can be persuaded to purchase more and more military-grade goods. 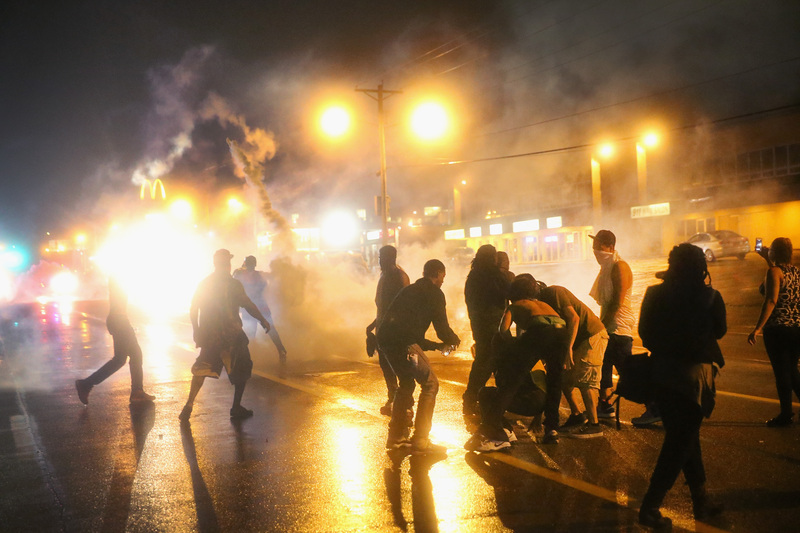 Excerpted from Tear Gas: From the Battlefields of World War I to the Streets of Today. Anna Feigenbaum is a writer, researcher, and educator. Her latest book is Tear Gas: From the Battlefields of WWI to the Streets of Today .